The debate on which form of employment is better is still fresh. Some people think that starting a business of their own has far better benefits than working under someone. On the other hand, there are people who believe the total opposite. Own businesses have their own pros and cons. However, it is the same case with the corporate jobs. Hence, the debate never seems to stop. 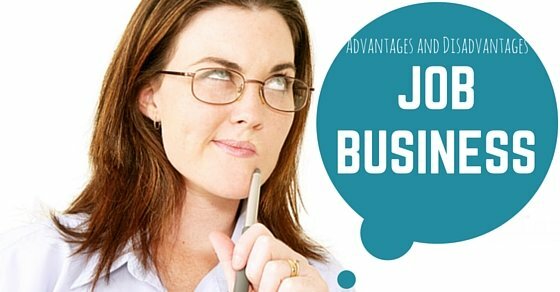 How about listing down the advantages and disadvantages of Job and Business i.e. self-employment and a corporate job. Be it a good MNC job or an growing business, the debate between business and job is an ever green topic. There are many people who love to do job and there are other set of people who love to do business of their own. Well as per my advice , it is better to slect the one which interest you. So before making a perfect choice give this article a good read. Usually, during student life you always dream of completing your graduation and once you get that degree, get a good job in one of top MNC’s. Well initially it will be great. You get to know many new things and can also learn new things that help you in your job. But slowly as time passes by, your life will be limited to home and work. Though there are many who seek this as safe and secured. Now that is true, but there are few who really get out of this monotonous life and start dreaming big. As mentioned above, many people try to start a business on their own and live your own life. Not everybody is able to get succeed, but the one who takes risks will only have the chance. Having a successful business is almost like a dream come true. It surely gives you more earnings and success when comparing to a regular job. The most eminent part for setting up a business is investment, so either you need to be rich enough to arrange it or can join others for partnership. When running a business, you need to work harder, as success or loss anything will totally depend on you. With the help of setting up a business, you will be helping to grow the economy of the government along with providing job opportunities to many others. Working under someone else has always felt like a restriction. However, when you are out there, setting up your own business, you are the in charge. This point itself is a boon in disguise. It gives you the freedom to choose and make a decision of your choice. It also lifts off the barriers of restriction from you. Moreover, being your own boss means that you can run the business with your own strategies without much ado about it. This also gives the elasticity to choose your own working hours. In addition, you also have the freedom to enjoy the family matters whenever it is required. The biggest complaint for defending starting own business is that the hard work that they do does not feel rewarding in corporate sector. I agree that the hard work must not be feeling rewarding as the salary is fixed in the corporate sector. Everyone enjoys the benefits of their hard work. The phrase ‘hard work pays off‘ seems relevant in the own business category too. On a longer run, owing a business have high scopes to be very successful in the future. One of the most successful company of its time i.e. Microsoft, started its journey from someone’s garage. Therefore, there is always a scope for betterment. All you have to do is just try it. Temporary or not, corporate sectors’ workers have no such guarantee of their jobs. They can be fired any time due to any reasons. The reasons may be the working performance, or recession’s demand. In your own business, you have the advantage of hiring yourself. Thus, the idea of firing yourself can never arise. As a result, you enjoy the freedom of working the way you want regardless of the fear of losing the source of your bread. The driving force that pushes you to achieve better is the satisfaction. You feel satisfied when you are able to do what you always want to. For example, your passion is your own beauty parlor. Everyday you do not have to wake yourself up unwillingly. Instead, your passion for your parlor will drive you. As a result, you would always make sure to be enthusiastic about your work. Your main motive would be to impress your client. This in itself would give you peace. This in itself is a reward for you. As a corporate worker, you do not get much exposure. You simply experience one part of the job. For example, if your job is to manage the marketing of the company’s product then you solely work under the marketing team. However, if you have your own business you are able to understand and experience all the angles and diameters of your work. For example, if you have your own beauty parlor you would have to look out for the salary, accounting, trainee fees, income, profit, etc. These things do not matter to someone who works as an assistant in the parlor. As an employee, you are aware about your annual income along with a little increment on your successful tries. Unless you get a promotion, your salary is stagnant. However, when owning a business you have the potential to earn more depending upon how you work and run the business. You might handle your own pricing and marketing strategies and set your own profit bar. This promises a lucrative income as long as the business is running. The following mentioned are few disadvantages of business management. Setting up your own business comes up with several challenges. Those tough challenges are one of the reasons for those who defend corporate jobs. Starting your own business comes with the risk of losing everything you invested just because of an unsuccessful business. If the business fails to flourish it falls flat on the shoulder of the entrepreneur. As a result, people think various times before opting for their own business. Before starting any business, first you have to set up a capital that can take the load of all the planning that you have done. Starting with the area of work to the employees, you have to manage everything. Thus, you have to build a capital. Taking loan for these capitals may also come of as risky, because the start of your business may not always begin with profit. It is a risky task to manage the financial burdens without any back up plans. There is no such guarantee of your business to flourish instantly or continuously. You might face the vicissitudes. However, the problem arises when the inconsistent loss continuous for months. At times like these, bigger problems like bankruptcy can appear. Moreover, if you have the burden of loan on you, the problems might accelerate out of your hands. Further, you might land in bigger trouble. Your own business gives you the freedom to take a holiday when needed. You have no one above you to ask for leave. However, at times of need you would need to work for extra hours with no extra pay. Thus, you will have to work extra and manage everything accordingly. Businesses can never work out without a bit of law in it. If you start your own business, you need to set up your own assets. However, when you collaborate up with some other institute you have to share your assets by default. When they believe that, you have done an error at certain point they might file a lawsuit. These business obligations may also affect the capital and profit of the company. These are the benefits and pitfalls of having your own business. However, the choice is subjective depending upon how well you can find the solution to the disadvantages. If the advantages works well for your company and disadvantages are hardly applicable, then setting up your own business will be a wise step. Now let us check out the advantages and disadvantages of corporate jobs i.e. corporate employment. Corporate sector is full of diversity. Various projects and innumerable posts give many opportunities to the workers. Here, the employees get exposure with different roles within the same department. Moreover, companies are the best platform to increase the contacts and train you to master the working experience. Corporate jobs earlier had a lot of restriction related to the work schedule and the type of work. However, now they have developed immensely. There are various positions where the employee can work from home or any other near by place that is suitable enough. This makes it a flexible approach. n addition, regular office attendees also get to meet each other, which help in getting social and collaborating more contacts. It also encourages the workers to strive for better through promoting a healthy competitive spirit in every one. Of course, you are not your boss in the corporate job but you still are paid and recognition for the hard and honest work. Here the salary might not face regular increments or boosts however; the fixed amount is always deposited by the due date. In addition, companies provide various facilities to the workers. The policies are somewhere done for the company’s benefit but they also indirectly benefits the employee in the time of need (regardless of the nature of his job i.e. telecommuting or not). Moreover, employees are also given timely bonuses depending upon their work or company’s success. Either way, there is no problem of the financial issue. Group projects are usually assigned in companies that have a large number of staff and vast projects to work. This gives an opportunity to each one of the employees to come in front and show leadership skills and teamwork abilities. This platform may come off as a step towards promotion. Promotions and recognition are the two motivating factors. When you are the boss of yourself, you are unable to feel complimented, as there is no one above you to praise your hard work. However, here the compliment from the boss makes you feel energised and ready to work on the next project. The advantages of working as a worker in the corporate sector or advantages of employment are quite vast but the disadvantages have not loosened their grip on this topic. They are comparatively stronger enough to defend the ‘own business’ idea of the people. Let us look at the disadvantages of employment first, and you may decide later on what suits you best.
. Everyone is running in the race to work hard and achieve a motivation in the form of promotions and/or recognition. Thus, this attitude gives rise to dirty politics within the company. Some people lack the healthy spirit by that extend that they not only try to work better than other does but also try to ruin other’s progress. More and more competition also affects the system, as the employer cannot keep the track of the everyday happenings between the group members. He or she has many other large things to focus on rather than the petty issues between the employees. Thus, the employer may never know who the deserving candidate for the promotion is. Large companies or small-scale companies, both face equal amount of interaction. In large companies, the staff is enormous that makes it almost a difficult task to be heard on the other side of the table. Your ideas may work wonders however, they are barely ever acknowledged. As a result, comparatively it is a huge task to be heard rather than think of an idea. On the contrary, in small-scale companies one is heard very often however, being heard and the rigorous hard work is hardly enough to get more pay. Due to the smaller budget, one is not able to get the dream pay or the deserving reward. You might have an extraordinary idea for a project. However, in companies first you need to take the permission before taking any kind of decision. This decision making process is again a vast process that needs several permissions, reviews, comments, risks, etc. By the time the idea gets any recognition, it happens that the idea no more seems that effective (of course, due to some circumstances). This comparatively makes it harder to implement ideas even when they could have pitched well in the market. Thus, now that you have a bit of insights on both the types i.e, job and business, you must carefully decide upon what suits you well. Remember, no matter what you decide, at the end of the day you will have to face both the aspects. You might be lucky enough to land in a corporate job that provides you more pros than cons or your luck might work well in your own business. There are innumerable possibilities to any decision however; the choice is still in your hand.